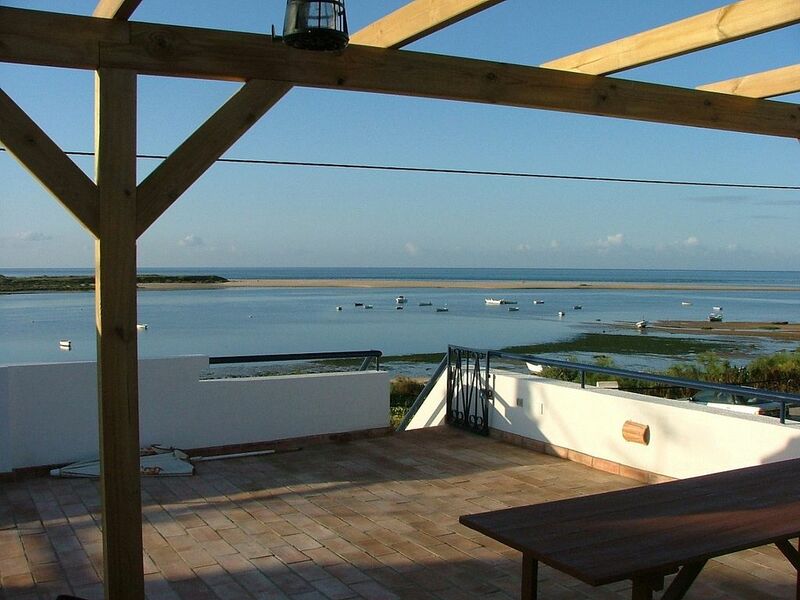 Casa Fabrica is a two bedroom fisherman's cottage situated in the stunning village of Fabrica on the Eastern Algarve. The cottage is on the bank of the Ria Formosa, one of the last remaining protected areas in the Algarve and a World Heritage site. Yet it is only half an hours drive from Faro airport. Fabrica is a small hamlet that is still home to many working fishermen. It is unspoiled and offers a welcome change from the more built up areas of the Western Algarve. It is home to the restaurant O Costa which is known throughout Portugal for its seafood. Fabrica is located one kilometre from Cacela Velha and its picturesque church on the cliff top. It is adjacent to the Quinta da Ria and Quinta de Cima golf courses and 5 minutes drive from the Benamor Golf Course. The house has been refurbished and has a new bathroom and kitchen. An additional feature is the roof top terrace with pergola, huge BBQ, sink and fridge. I am English and my wife is Portugese. We have owned and let out the property for many years and my father in law manages it for us. We bought this property for the stunning view, its direct access to the beach and because it is in such a quiet and unspoilt village. Free wifi, no download limit. For use in house (not for beach). Lounge with TV, DVD and CD player. The living area is open plan with the kitchen. Cooker, fridge/freezer, hob, dishwasher microwave and washing machine. New kitchen. The kitchen is open plan with the living area. Highchair available on request only. Indoor dining is stools at a breakfast bar. Outdoor dining is garden furniture. Cable tv. Some UK channels. CD, MP3 radio and auxilliary line in. A selection of DVDs are available. Books in English and Portuguese. During high season a boat operates from the restaurant to ferry people to the beach. To front of house and on roof of house. Amazing views. Fabrica is the closest village to the Quinta da Ria and Quinta da Cima golf courses. It is no more than a 3 minute drive to the clubhouse. There is a 3rd golf course - 'Benamor' close at Conceição, and a 4th 'Castro Marim' some 20 minutes drive away. Notes on accommodation: There are two travel cots and two high chairs. Please let us know if you will be using these. Outside: Patio to front of property. With outdoor furniture and barbecue. Stunning views directly over the Ria to the sea. The roof terrace is accessible by outdoor steps. It is a huge terrace with views over the Ria. There is a large brick built BBQ, a sink, a pergola, a fridge and outdoor furniture. Cleaning / Towels / Linen / Maid service: Towels and linen included. Changed at end of stay when house is cleaned. A friendly and open atmosphere in the whole cottage. Welcome absence of various notes telling us what to do and what not. Great lighting; wonderfully spacious surfaces; very nice open space with kitchen and living area together and good colour scheme throughout the cottage; all electrical equipment easy to use; special Thanks for providing 2 continental plugs ! Now: the drawers in the cupboards could do with a good sort out (several things defective or unusable but otherwise plenty of good usable things as well); the municipal dust carts are disturbing regularly at least twice a week around 23.00; two barking dogs in the neighbourhood do the same thing; and various loud noises plus men's shouts between 23.00 and 24.00 occur almost every night ( building work goinmg on?). We loved to water the plants and watching them! Altogether a happy stay in this well thought out place. We liked the Fabrica cottage because of it's position on the beach. It is good for birds and wildlife and is a peaceful, undeveloped beach. There is a good restaurant very close and a snack bar but it is all very relaxed. The cottage has a lovely roof terrace with barbecue and loungers which we did use and enjoy.There are most things that you need but some things such as crockery, kitchen utensils ( no working coffee maker) and some of the living room furniture could do with an up date. Bedrooms were nice and fresh and the beds were comfortable. The shower works well but could do with a good clean. Overall we enjoyed our stay here and I can recommend "The Long View" by Elizabeth Howard which was on the bookshelf and i could not put down! My husband and I were looking for a weekend getaway where we could relax away from the typical crowds of the Algarve. We found our little hidden gem! This place has a magical feel of time standing still. The quaint cottage has every modern convenience, and, even more importantly, it has character and charm well beyond any high rise hotel. The rooftop is amazing, and the restaurant across the street was one of the best we've tried in Portugal for fresh fish. Simple accommodation but charming and we enjoyed the big bathroom. The house is cosy and the view from the terrace is overwhelming. Its location is perfect, right in front of a fantastic beach. There is no better place to relax and enjoy nature in all its glory. Thanks so much for this blissful week, we'll definitely be back! Great location. Pleasant, simple house. I stayed here out of season so my expectations and impressions may not be typical. I wanted tranquillity and apart from a few barking dogs, that's exactly what I got. Fabrica is a wonderful place for peace and quiet - out of season. The house is charming but simple. The house is on the banks of the Ria Formosa which is a lagoon between the mainland and the Manta Rota peninsula and Cabanas islands. The beach is literally across the road. There are miles of open expanses of sandy beaches that are suitable for children. Even at the busiest times you have only to walk a few minutes to relative seclusion. At low tide you can wade to the beach or you can take a boat from the village. You can drive 5 minutes to Manta Rota and access the beach by foot. Faro airport is a approximately half an hour's drive away. Lisbon is two and a half hour's drive and Cadiz, Seville and Jerez airports in Spain are all accessible. Hiring a car is advisable to get you to and from the airport and also bear in mind that the village has no shops (just a restaurant and daily mobile shops for basic provisions). The village is a traditional fishing village. There are mobile shops that visit daily selling fish. However if you miss these then you will need to drive to the nearest supermarket (5 minutes). There is also an excellent restaurant in the village that is known thoughout Portugal for its seafood. There are many restaurants/bars etc at Tavira, Manta Rota, Vila Nova de Cacela, Conceição and Cabanas - all 5/10 minutes drive away. The nearest food shopping is also in these towns. You are actually in the Ria Formosa Natural Park which is very popular with birdwatchers. Tavira (10 minutes) is worth visiting. It was described in The Independent as 'by far the most attractive town in the Algarve'.